The hoisin sauce in this dish is sweet, salty and spicy and gives the lamb an Asian feel. 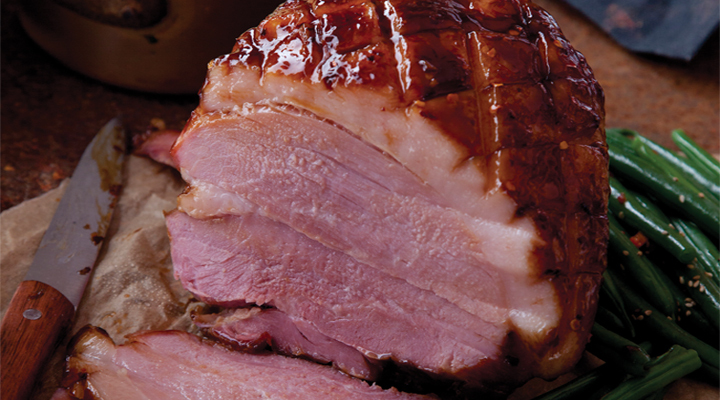 First weigh your ham to calculate the cooking time – it will need 20 minutes per 450g. Place the ham in a large saucepan with the carrot, bay leaf and ginger and cover with water. Bring slowly to the boil, then reduce the heat and simmer for 20 minutes per 450g. Once cooked, remove the ham from the pan and allow to cool slightly. Using a sharp knife, carefully remove the skin from the ham, then score the fat in a criss-cross (diamond) pattern. Combine all the glaze ingredients in a small bowl. Brush the surface of the ham with the glaze, then cook in the oven for 15 to 20 minutes, until golden brown. Remove from the oven and allow to rest for 20 minutes, covered in a foil tent, before carving. Meanwhile, to make the mash, place the potatoes in a large pan and cover with water. Bring to the boil, then reduce the heat and simmer for 30 minutes, until cooked through. Drain and pass the potatoes through a ricer into a pan or mash with a potato masher. Add the butter and cream and mash again to combine, then season with salt and pepper. Ten minutes before serving, bring a large saucepan of salted water to the boil. Add the green beans to the water and blanch for about 6 minutes, until the beans are just tender or al dente if preferred. Drain, then place in a bowl and toss in the toasted sesame oil, sesame seeds and chilli, if using.